Some days, I feel like a rockstar mom. Then I see a blog where a mom has a cute little bento box full of healthy and creative snacks for their kids and star-shaped sandwiches for their lunches, and I just want to smack my head against a wall. Bimmer is pretty much a normal toddler when it comes to eating. She likes what she likes. And she's strangely picky about things I never would have expected from a toddler. 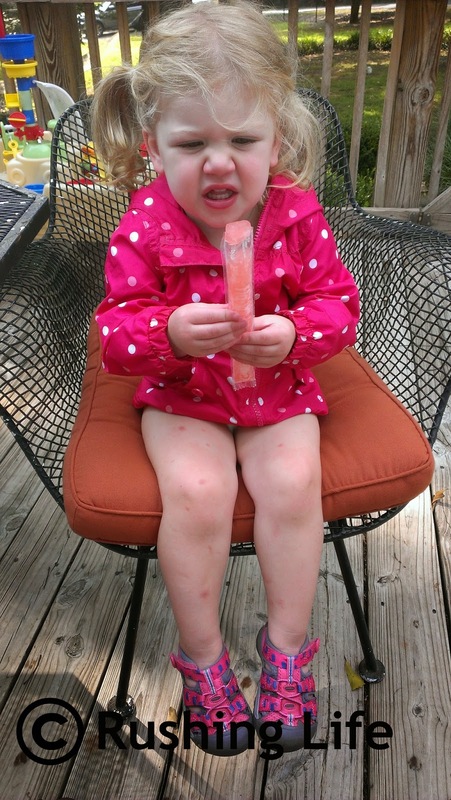 For instance, she does not like popcicles. I thought I'd throw together a little smattering of the things we typically throw at her during feeding time. By doing so, I'm hoping you'll notice a glaring hole in my offerings and give me some suggestions. Breakfast: Let me start off by saying that Bimmer is not a breakfast eater. Sometimes she'll take two bites of something and be done. Other times, she'll just have milk or water. Whatever. Froot Loops (dry) - And she calls these "boop-a-loops" and I'm inclined to always give them to her because it's so cute when she asks for them. Snacks: This kid loves snacks. I'm pretty sure she has a "dinner" that is just a mix of a bunch of snacks at least once a week. Lunch/Dinner: Her entree selection is limited, and part of that is because I don't have the time/patience/desire to actually cook. She'll survive. Sides - as for some of the items above, naturally, a side dish would be served as well. Her favorites are any type of pasta side or rice. Or french fries. Girl loves fries! Drinks: She exclusively drinks water, 2% milk, and apple juice. And 95% of the time, we cut her apple juice to a 50/50 mix with water. She has taken a few sips of soda over the past year and has never liked it. And on super rare occasions when we have a chocolate malt, she takes a few sips. But otherwise, she's not interested. And we're not interested in serving anything else to her! So, again, if you have any mind-shattering suggestions for things we can introduce, let us know! It still boggles my mind (but also makes me happy) that she doesn't like chicken nuggets.